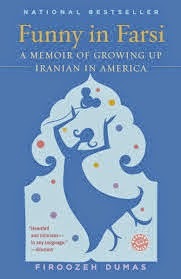 Firoozeh Dumas’ first memoir, Funny in Farsi: A Memoir of Growing Up Iranian in America (NY: Random House, 2003), is a collection of lighthearted essays that illuminates her childhood experiences growing up as an Iranian transplant in Southern California. She and her family arrived before the Iranian hostage crisis and Revolution, and she clearly shows how she and her family were treated before and after this great divide. There were two reasons that I picked this book for the April/May selection for the online foodie book club, Cook the Books, that I and my wonderful blogger buddies, Deb, Simona and Debra, organize. First, this book offered me an excuse to explore the beautiful, fragrant Persian cuisine that Dumas describes in her book. Lucky Californians that get to dine out in numerous Persian restaurants started by Iranian-American immigrants! Second, I picked this title because I feel like too often Iranians (and Iraqis, Aghanis, Pakistanis and now, Russians - yet again) get demonized in the press because of the actions of their political leaders. As Dumas so expertly shows in her anecdotes about her goofy relatives, her own culture clashes at school and as a young teen, there are universally human traits that we all share around the world, no matter our ethnicity, religion, etc., and I wanted to have others read about her experiences. A little extending of the olive branch, or rather, a bowl of olives, out into the world, if you will. The best parts of Dumas’ book were her descriptions of her father, Kazem. He is such an interesting mixture of intellect and childish enthusiasm. He was a petroleum engineer back in Abadan, Iran, and later earned a Fulbright Scholarship to continue his graduate education in the U.S. It was during his American sojourn that one of his professors took him on a road trip to Princeton where he met (and flummoxed) Albert Einstein. After launching into a endless monologue of his American experiences, Einstein was rendered somewhat speechless. Or perhaps he took a mental vacation to hone his Theory of Relativity during Kazem’s "year's allotment of conversation". I didn't have any cookbooks at the bookshop, or in my home library about Persian cooking. The local library's few volumes were out on loan, and I ordered a copy of "Cuisines of the Axis of Evil and Other Irritating States: A Dinner Party Approach to International Relations" by Chris Fair (NY: Globe Pequot Press, 2008) but it arrived after I'd made the meal I was planning for this post. Fair's book is so wonderfully witty, educational and droolworthy all at the same time, so I'll be featuring something out of its pages here sometime soon. I finally settled on meatballs spiced with sumac (already had it in the spice cabinet) and a dried rose petal-less advieh, that Persian spice mixture that contains cardamom, cumin, and coriander, all of which I did have on hand). 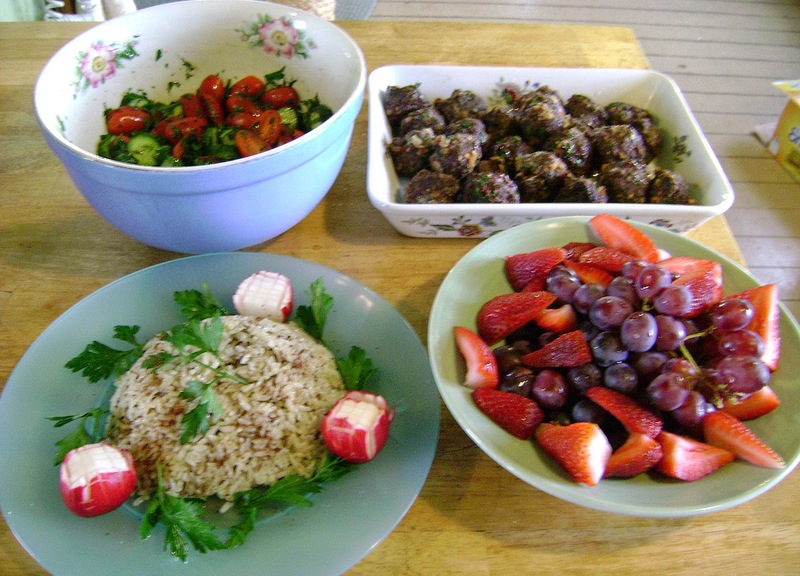 I got the recipe for the fragrant meatballs at Silk Road Diary, and then made up a pot of rice seasoned with sauteed garlic and cumin seeds which I shaped into the traditional Persian dome shape and decorated with radish roses and curling parsley springs. Our Iranian feast was rounded off with pitcher of cold mint tea, a chilled cucumber, tomato and herb salad and some fresh fruit. You can still join us at Cook the Books by reading and blogging about this wonderful book by the June 1, 2014 deadline. I will have a roundup of posts up a few days later so that we can all enjoy our various takes on the book and partake of our virtual Persian feast. It looks beautiful! I really enjoyed this book. Great review Rachel and a very fun book pick. I enjoyed the re-read and the chance for the CTB group to delve into a new cuisine is always a treat. Your meal looks amazing. I am big sumac fan and probably would have made some yummy meatballs too, instead the eggplant-based soup/stew I made if I were still eating meat. I do miss meatballs--the veggie versions just aren't the same ;-) The tomato-cucumber salad is another favorite dish of mine--it seemed to often be on the table at my roommates uncle's house. Your meal was quite a feast. What a gorgeous meal! I loved this round of Cook the Books! Your meal sounds altogether quite delicious. I agree about the olive branch, however difficult at the moment, especially with Christians daily being crucified, shot and beheaded in the Mid-East by Muslims. At this moment shops are being torched in Egypt. I find it interesting how there are some dishes that must be eaten as soon as you mix the ingredients, while others need time to mellow. I like that there is some alchemy involved which I don't completely understand: it makes cooking a new adventure every day.